If your car runs on regular, you would never even think of putting diesel fuel in your tank. You wouldn't try to run a flashlight on D batteries rather than the AA batteries it needs. That's because trying to operate any electronic device or tool with the wrong power source can be, at the very least, ineffective. In some cases, using the wrong fuel can be damaging and even dangerous. Using the right fuel mixed with the accurate ratio of components is essential for the safe and efficient operation of your Stihl chainsaw. Stihl gasoline-powered equipment uses a 50:1 ratio of gasoline and 2-cycle engine oil. Learning how to mix your fuel properly is important in keeping your chainsaw in excellent condition over time. Before you begin mixing, make sure you read the manual that came with your specific chainsaw for information on any unique needs it may have. If you lost your manual, online versions are available on Stihl's website. Make sure you use a gasoline container specifically created for this purpose. No-spill receptacles reduce splashes, spilling, and evaporation. When choosing which gasoline to use, keep in mind that this isn't the place to skimp. Unleaded gasoline with a minimum octane rating of 89 is recommended. A lower octane can cause some issues, such as increased engine temperature, increased piston seizures and engine damage. 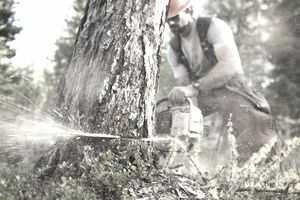 Stihl offers 2-cycle oils made especially for Stihl chainsaws. Premium quality 2-cycle fuels provide protection for your engine. Pour the oil into your gasoline container before adding the gasoline. Close the container and shake it thoroughly to ensure it mixes together. Before fueling your chainsaw, make sure you clean the fuel cap and the area around it to keep any debris or dirt from getting into the fuel. Position the machine so that the fuel cap faces upward. Remove the cap slowly so any pressure that has built up can be gradually released. This precaution can minimize the risk of getting fuel on your skin or inhaling dangerous fumes. Only mix enough fuel to last you one to three days at a time; this limit keeps the fuel fresh and minimizes the risk of any buildup. Never store fuel longer than three months. If your fuel has been sitting for any length of time, shake the container to mix it up again. Storing the mixture should be done with care, away from anything flammable and away from your home. If you find mixing to be too time-consuming or annoying, Stihl does offer customers other options to run their chainsaws. They sell Stihl MotoMix pre-mixed fuel, a high-performance mixture that is ready to use straight away, eliminating the need for measuring, shaking and storing. Whether you purchase a pre-mixed fuel or mix your own, following the correct ratio can keep your chainsaw working properly and keep it working for years.